MMasks and puppets are prevalent in many cultures around the world. 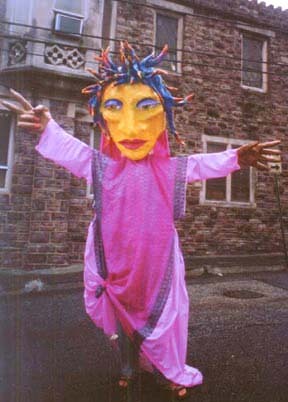 Large scale puppets are larger than life which generates imagination and connect people to something greater than themselves. Building large art pieces can lift one’s esteem through the process of creating and performing at a festival or pageant. Most of the materials used in the large scale puppets are recycled which model how "to make something out of nothing." Visit the Puppet gallery and be sure to view the quick movie. 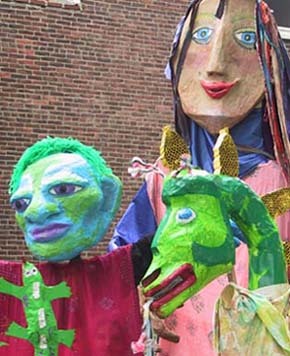 The puppets were built by the community in workshops sponsored by Lynn Miller and ETC in Pennsylvania and Switzerland. Contact us if you are interested in having Big Puppet workshops to build community in your school or organization.